EVENT: What’s different about retirement? You’re invited, August 15th from 12 PM to 1:30 PM at La Playa Mexican Cafe located at 502 S 77 Sunshine Strip Harlingen, TX 78550. 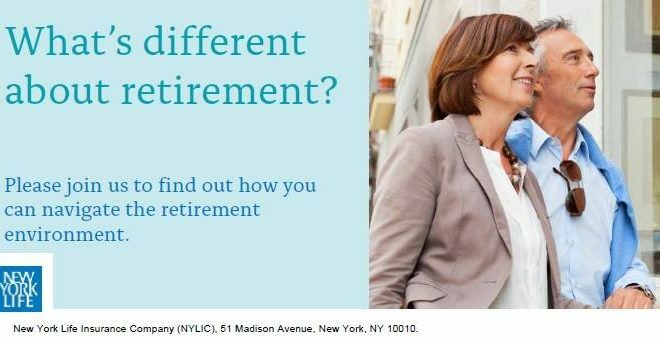 Learn about the retirement environment, risks you might face, and possible ways that New York Life retirement solutions can help you throughout retirement. Join us for an informational seminar and insurance and investments sales presentation on New York Life’s family of products and services. For more information, contact New York Life Partner Danielle Goslin at 956-412-4949 or dmgoslin@ft.newyorklife.com.